1) Trade with the major trend. Find out if the market is in a Bull trend or Bear. 2) Using the CCI(5) on the daily chart, look for setups. In this example we will assume the Market is in a uptrend (Bullish). Look for stocks trading under the -100 zone which is considered your setup. 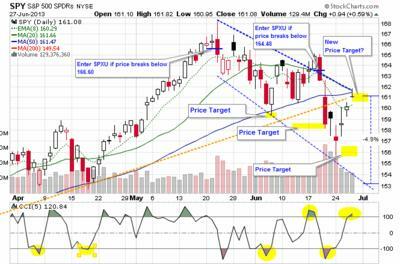 3) Place a buy-stop order slightly above the high for that day. If the next day the stock trades higher, it will "Trigger" you in on the stock. When you are "triggered" in, place a sell-stop below the last pivot low. 4)Once the CCI(5) reaches above the 100 zone, you will sell half of the position to lock in some profits and move your sell-stop at your entry position. If the stock continue to go higher, simply move your sell-stop to the last day's low. 2. Don't use no more than 10% of your trading account on any one trade. 3. Don't try to second guess where the tops or bottoms are. Let the "shift in momentum" trigger you in. ** If you'll like to see some actual trades with charts, then I invite you to follow me on Twitter. Look for Stock Hunter (red bull icon). I would be remiss if I didn't say I enjoyed your post even though I am writing this on 030616. I am curious it seems that a buy signal occurs when CCI5 is PLUS 100 with same conditions you proposed. Also why don't you join StockTwits it's free and you will be exposed to like minded traders. Thanks, glad you like the swing-trade strategy. Using leveraged ETF's help reduce risk compared to individual stocks. This way I am always Bullish, using regular and inverse ETFs. It works for me and my swing-trading style. 2) Using the CCI(5) on the daily chart, look for setups. In this example we will assume the Market and the stock you're looking at is in a downtrend (Bearish). Look for stocks trading over the 100 zone which is considered your SETUP. 3) Place an order to go short slightly below the low for that day. If the next day the stock trades lower, it will "Trigger" you in on the stock to go short. When you are "triggered" in, place a sell-stop below the last pivot high. 4)Once the CCI(5) reaches below the -100 zone, you will sell half of the position to lock in some profits and move your sell-stop at your entry price. If the stock continue to go lower, simply use a trailing sell-stop to the last day or two highs. Hope that helps you in your trading. Really like your setups and trading style - CCI(5), MACD(5,9,2) and stochastic(5,1) - especially with leveraged ETFs. What's the best way to contact you (searched but couldn't find an email address)? how to enter a short trade? Excellent question -- I treat gaps as part of doing business. If it gaps up and goes in your direction, then it is considered a blessing even though you had paid a higher price. But sometimes when it gaps and then pulls back, then that is where having a sell stop at the last pivot low comes in handy. That is why it is to important to first trade with the trend so that the odds are in your favor. Over time, you'll gain confident on your strategy so that gaps become become a welcomed event. Looking at FAS daily chart, on Jun. 20th the CCI(5) gave us a setup signal to be ready for a reversal. Then on Jun 25th it gaped up an our entry is higher at 59.48, however since we know FAS was making lower highs and lower lows, we are trading against tend (counter trend trading), so on Jun 26, the CCI(5) is now above 100 range we decide to sell half for a 4.6% near the close, and place a trailing stop at the lows. On Jun 28th, price dip lower than Jun 27th lows, thus selling the remaining position for a 6.4% gain. So on that trade scenario we had three gap-ups all in our favor. Thanks for the great post. How do you handle gaps? Seems like quite a few lately in TNA, FAS, and others. I mainly use it on leveraged ETFs, such as SPXU, TQQQ, TNA, FAS, DZZ, etc. There is so much action on leveraged ETFs, I finding less time for individual stocks. However, it will work on trending stocks as well. For regular stocks, I try to stick to IBD's top 50. 4) Then drill down to the hourly chart look for a divergence signal on the CCI(8). 5) Place a buy-stop to be "triggered in" if the hourly candle can break above the last candle high. neat ; do you use it for ETFs only or for trending stocks too ? Does it work with hourly time frame?